Established in 2006, the sprawling IISER Pune campus is home to a number of specialised research centres with world-class facilities. 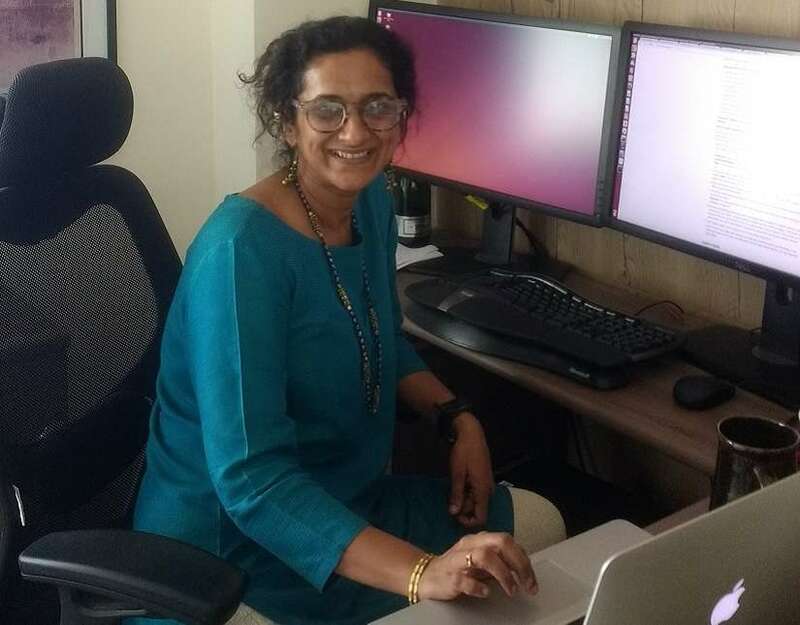 One among them is the Computational Neurobiology Lab (CNB), headed by Suhita Nadkarni. “We’ve never been closer but we are not there yet,” she said. Like many scientific journeys, Suhita’s began — in her words — “with a curiosity about the world, nature around and the general principles that govern these systems”. Growing up in IIT Bombay, she became passionate about physics and decided to pursue research in the field. She earned her PhD in 2005 from Ohio State University. Although her PhD was from the physics department, it introduced her to theoretical and computational neuroscience. She was involved in developing computational models of communication between star-shaped cells called astrocytes and neurons. “Neurons are the electrically charged cells in the brain that fire electric impulses, while astrocytes are electrically silent with no charge and were hence considered as side-kicks,” explained Suhita. Her PhD was a deep dive to understand how the sidekicks affected communication and memory processing in the brain. Suhita worked in two labs in the US for her postdoctoral research — Terry Sejnowski’s lab at the renowned Salk Institute and Herbert Levine’s lab at University of California at San Diego. Her mission was to expand our understanding of why astrocytes matter. There were no previous modelling studies that looked into this. Her team was among the first to create a framework for accommodating these new and important entrants to the field of neuroscience. “San Diego is globally considered a hotbed for neuroscience research and offers opportunities for interactions with the world’s experts. The excitement there was palpable and contagious,” she said. During those years, Suhita attended and presented her research at meetings of the American Physical Society and American Biophysical Society. “I started off tackling my research questions from the lens of a physicist and a modeller, but these meetings made me realise the value of being an insider — being a neurobiologist rather than a physicist trying to understand the brain. It was important to understand the details before making ‘spherical cow’ assumptions and resorting to oversimplifications typically made by physicists,” she recalled. “I realised I could not find the answer to these questions about the complexity of the brain by sitting on the fence but will have to jump into it to understand the workings of the human brain inside out!” So Suhita finally took the plunge into the intriguing field of neurobiology. She is nostalgic about afternoons at Salk Lab, when she and her colleagues would gather for tea. This culture is supposed to have been started by Francis Crick (one of the scientists who is credited with the co-discovery of the structure of DNA based on X-ray diffraction images taken by Rosalind Franklin and colleagues). These informal tea breaks were in reality brainstorming sessions in neurobiology, much to the joy of Suhita, who hungrily took all the knowledge in, straight from the experts. Suhita and her husband Dr Collins Assisi, currently a fellow neurobiologist at IISER Pune, were both postdoctoral researchers at Salk Lab. She recollected how the two of them introduced their colleagues to the Indian-favourite Parle-G biscuits during these afternoon tea breaks while discussing the mysteries of the human brain! Even back then, IISER Pune was the top preference for the husband-wife duo. At IISER, before she could set up her own lab, Suhita had to ensure all the data her lab would generate could be handled by a robust computing system. She had to overcome the challenge of establishing a high performance computing cluster (HPC). “Finding local technical experts who could build and maintain these clusters was a major challenge since both Collins and I had only been end-users of such clusters prior to our move to IISER. Setting up this facility from scratch was a huge learning experience,” she says. In order to fund this high-performance cluster, Suhita, Collins and their colleague MS Madhusudhan pooled together their Wellcome DBT India Alliance funds with assistance from IISER Pune and their efforts paid off. They succeeded in setting up the supercomputer cluster in 2012, which is now accessible to students from all three of their labs. Suhita needs all this computation to decipher what happens in the brain’s synapses. 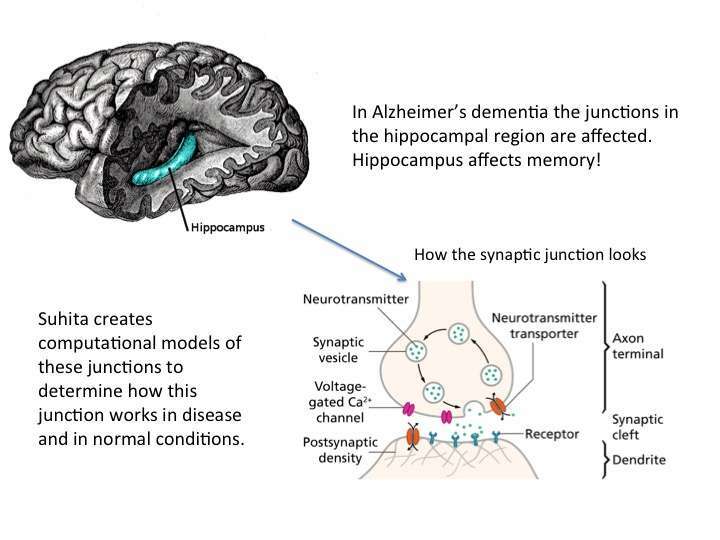 The synapses are junctions between neurons, where they talk to each other. The exchange of information between neurons occurs through electrical charge and chemicals called neurotransmitters. To study this communication between neurons, Suhita finds it useful to compare the workings of the human brain under normal versus diseased conditions. One such disease is Alzheimer’s Disease (AD). AD starts with ‘short-term memory loss’ and later leads to loss of ‘retrieving’ old memories and spatial memory. For example, a patient may forget the way back home. Using AD as a disease model, Suhita’s group looks at different aspects within the synapse that may have gone wrong leading to the disease. Behavioural studies have already shown that the hippocampus, an area of the brain associated with learning and memory, plays a role in the development of AD. Within the hippocampus, experiments have identified defective “plasticity” at the synapse to be one of the causes of AD. Whenever we recall events stored in our memory, a specific group of neurons is activated to recall the memory. However the ability to activate the correct combination of neurons over all other combinations of neurons is dependent on ‘synaptic plasticity’ or the strength of the neural connections. Studies have shown that plasticity, or the strength of neural connections, is dependent on the chemical pathways involving calcium in the cell. When these signalling pathways turn defective, plasticity suffers, leading to a loss of cognitive functions. Suhita’s lab is investigating the chronology of these events in AD. 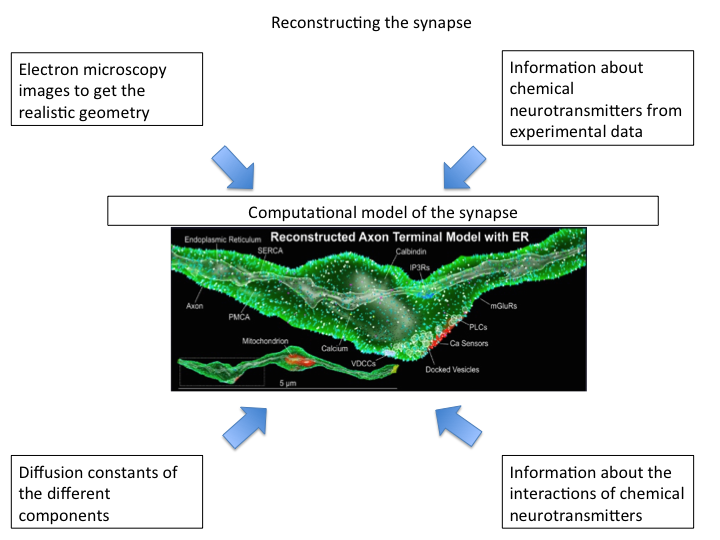 For this, they use very detailed calculations to model the synapses. Reconstructing the synapse is hard work, requiring many elements to be brought in together. “Realistic geometries of the neurons are drawn from electron microscopy images, and then other virtual ‘ingredients’ are added to build the model.” These include information, measurements, features and biophysical properties of various components of the process she wants to model. Analysing so many parameters together requires advanced computation and this is where the computing cluster comes into play. Suhita with her team at CNB lab. Teaching is an integral part of Suhita’s job at IISER Pune. She is grateful for the freedom to tweak the general syllabus to generate interest among the students. In her words “when the brightest brains choose to study neuroscience, the field and the lab benefit from it”. This is one article in a series of 30 profiles on the life of science of Indian women scientists whose research has been funded by Wellcome Trust/DBT India Alliance. We are thankful for a grant from India Alliance towards this series that has allowed us to invite voices of fellow science writers on this project.